Team Flash introduces HR to Earth-1 when a monstrous meta-human attacks Central City. Meanwhile, Caitlin visits her estranged mother for help with her frost abilities, and Barry tries to reconcile with Julian. The introduction of another Harrison Wells is a favorite ongoing plot of mine. Tom Cavanagh is brilliant. HR is Harrison Wells but also his own person; it's fascinating. Also, I enjoyed the little things about him: he's goofy, he wears that hat and carries around drumsticks, he brings food and coffee to work, he makes crazy references, and he's a fake! I was actually not expecting that. I knew there was something up with him, but I thought it was going to be more sinister. I'm glad it's not; I'm glad it's different. I'm looking forward to more of him. At the beginning of this episode, I started to loathe Julian. He's just a complete jerk over and over. Then the story of why he's a jerk and hates metas starts to unfold: he's jealous. He sees the criminal metas wasting their abilities and he believes that he would do better with powers. (Raise your hand if you want Julian to get meta-powers in the future.) But in addition, his family is part of who he is. And I think that's good. I think that helps him and Barry connect, and I'm grateful they're trying to get along. There's hope for you yet, Julian. Cisco was great in this episode. He was just so done with HR and his antics; it was amusing. I also love that Barry is staying with him and trying to make him breakfast and everything. Cisco has changed a lot this season, but I'm happy to see he's still solving problems, making geeky references, and being a good friend. Cisco Ramone, never change. The monster meta plot line didn't work for me. It felt out of focus this episode. I wasn't even worried that they couldn't stop it. It was fugly and such, but I didn't feel there was that much tension with it. When we learn it's just a kid projecting a hologram, it got even worse. We get to see why the kid did it, but it fell kind of flat. I didn't feel one way or the other with its conflict or conclusion. Introducing Caitlin's mom was an interesting point, but I didn't really like her. (I don't know if I'm supposed to either.) While I'm glad she came to her daughter's rescue, I just felt bad for Caitlin the entire time because her mom is kind of a jerk. While I was excited that Caitlin is getting help with her powers, this episode worried me. They learn if Caitlin continues to use her powers, things will go badly. But why? There isn't a reason why. Why does using her powers make her evil? I was hoping she'd get powers and then fight off the "Killer Frost" stereotype and become her own person, not just her Earth-2 counterpart. But instead, the writers are just having her get frustrated and use her powers erratically. I'm both excited and disappointed in the direction they're taking with her. I guess it could change though. Overall, this episode was so-so. It had good moments to move the season plots forward, such as Caitlin's powers and the new Wells. But the episode plot of the monster just didn't work for me. The Star Wars references, though, were perfect. What did you think of "Monster"? 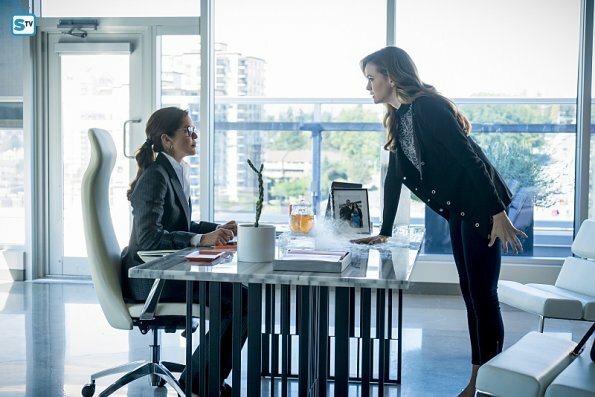 What do you think is going to happen with Caitlin?